Air Fryer desserts are fabulous! 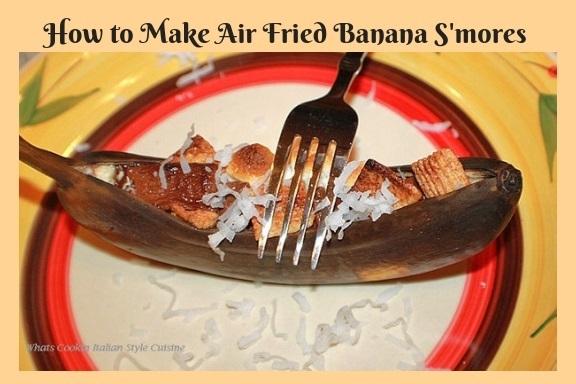 I love fried bananas and was thinking why not make them in the air fryer? 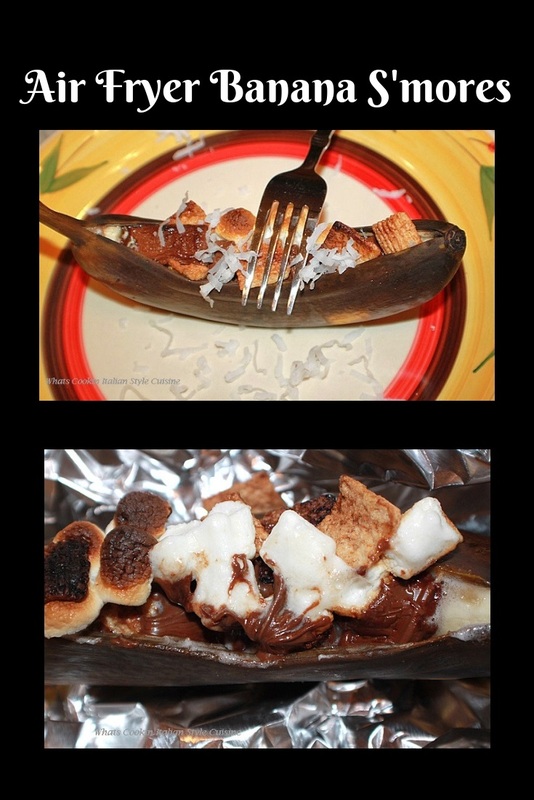 These were so delicious and the ease of these Air fried banana s'mores are the perfect fast dessert. They sure keep summer alive all year long. Perfect for parties, picnics with just a few ingredients. The melted chocolate, marshmallows, and little cereal bits are a decadent dessert you will make often! We love to make these for guests even in the winter time around the fire pit in our yard. It's a fun sweet treat that everyone loves and brings out the kid in you. The kids love these banana s'mores they really make everyone smile. Scroll down and get this easy to make Air Fryer recipe and don't forget to watch the quick video! I love to make these on game day events. 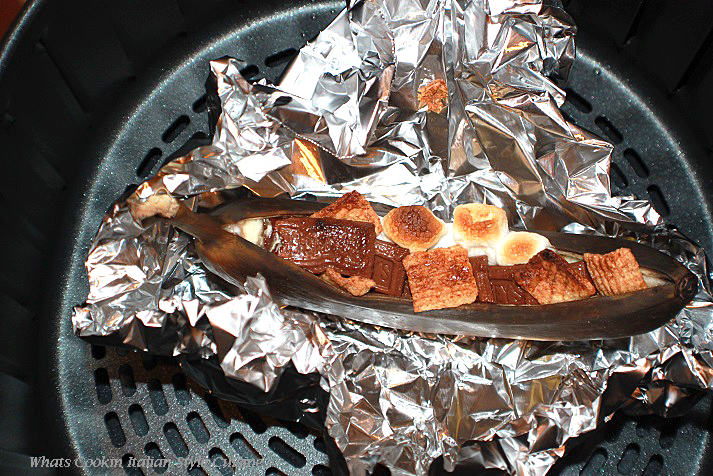 Everyone loves to get cozy by the fireplace and it feels like we're camping out with our foil packet dessert. This air fried dessert is a comforting one with all the gooey marshmallow and melts chocolate. The bananas are a delight with these simple ingredients. The best thing is they are pretty portable to bring along to any party event or planned outing. I love the ease of not standing over a fire and making everything individual and still get the great s'more flavors. No dishes needed everything is right there and a throwaway, isn't that a bonus? The kids love these and can help make them, they're so much fun to build. I like to spray the foil, just in case something spills over for easy cleaning. My air fryer stays nice and clean everytime we make these. 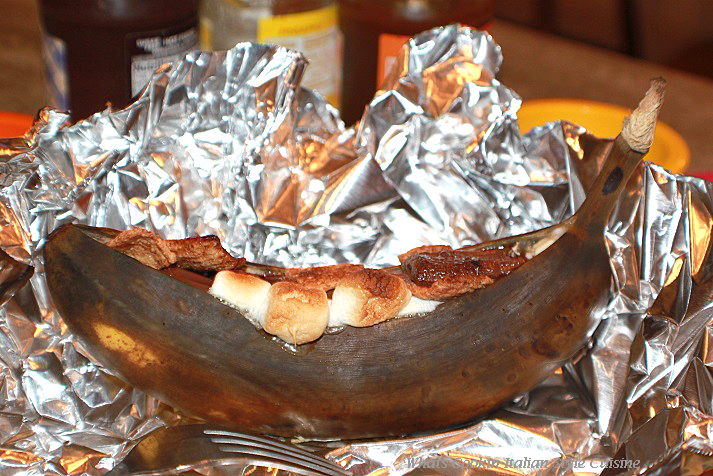 You just want to open the top of the banana just enough so you can top it with your favorite additions. There are so many suggestions I added to give you an idea of making these to fit what your family loves. Even if you don't have cereal in the house, you can always keep a box of graham crackers on hand and break them up. Make sure they are small enough. Also, you can use chocolate chips instead of Hershey bars. I always keep a bag of marshmallows on hand in the pantry. You can build them any way you like, I like to start with the chocolate first, marshmallows and cereal last. The marshmallows toast up perfectly and blend in with the melted chocolate! Have fun build them however you like. It's a great project for the kids to help you with and love getting to help in the kitchen. You always want to keep the top open for proper air flow. I want my marshmallows to toast perfectly and this will make it work to perfection. Toasted on the outside and soft and melted on the inside. My Air fryer is over 1500 watts, so I check mine at 3 minutes. Sometimes 4 minutes tops. Just keep an eye on the marshmallows and chocolate so it doesn't burn. Make Sure You Preheat First! My Air Fryer has a preheat option which I recommend. If you don't have that, then place you air fryer on 400 degrees for 14 seconds. Who doesn't love all that melted chocolate? The chocolate and bananas certainly go famously together! Use caution taking these out of the air fryer, they are extremely hot. You can let them rest around 5 minutes before serving. Tips to Change it up! Ok, you may not be a huge fan of s'mores? Try your banana dessert using peanut butter chips and peanut butter. How about maraschino cherries, chocolate, and crushed Oreo cookies? We love adding coconut, walnuts, chocolate, and top after it cools with ice cream and hot fudge sauce topping. Get creative and mix and match a dessert you will love. You can top the cooked banana after it's cooked with whipped cream, ice cream, and ice cream toppings. 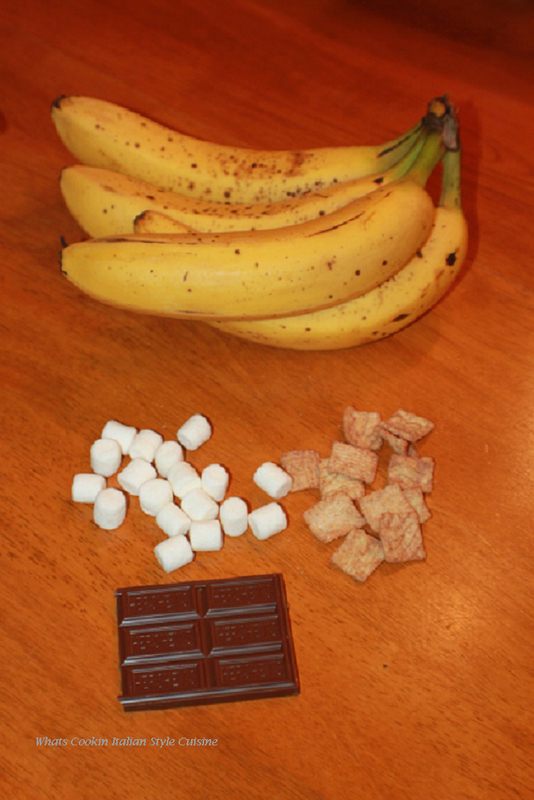 These are an Air Fried dessert made with banana's marshmallows chocolate and cereal. It's a quick delicious treat and perfect for picnics and parties. Pre-heat the air fryer to 400 degrees. Open the banana slightly to form a pocket on top. Add your toppings of choice and pick from the options. For Smores add the chocolate chips and marshmallows. Place the graham cracker cereal inside the toppings snuggly to fit. 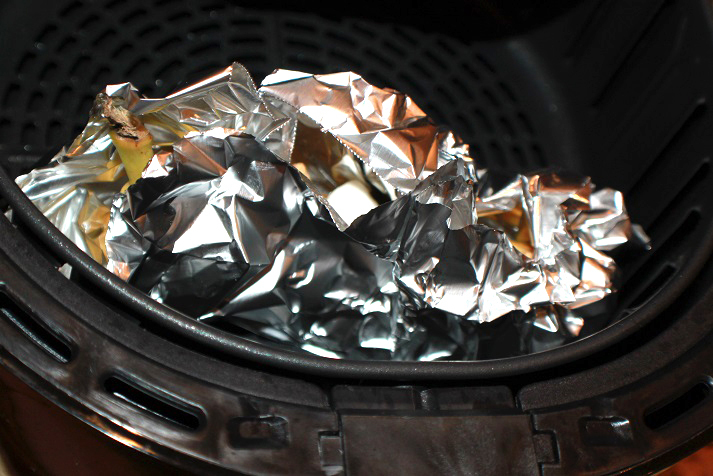 Fold the sides of the foil up leaving the top open. 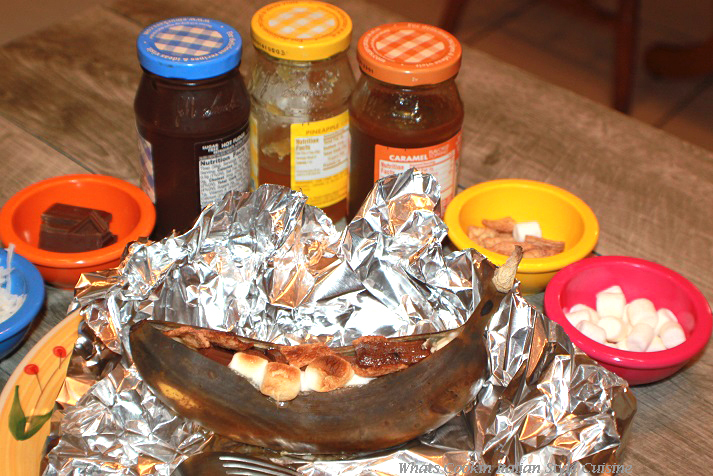 Place the filled bananas wrapped in foil into the air fryer basket, with the open foil top up. Let cool for a few minutes before eating them. This is a great summer dessert for backyard picnics, parties and easy to transport!! This sounds like a fun treat! I am convinced we can make ANYTHING in an air fryer! This looks sooo amazingly good. I can not wait to try this unique recipe. And why I have not seen it before, it's really impressive. I will definitely do this for my family. I don't have an air fryer but will make these on the grill when spring arrives! What a clever recipe and so original. 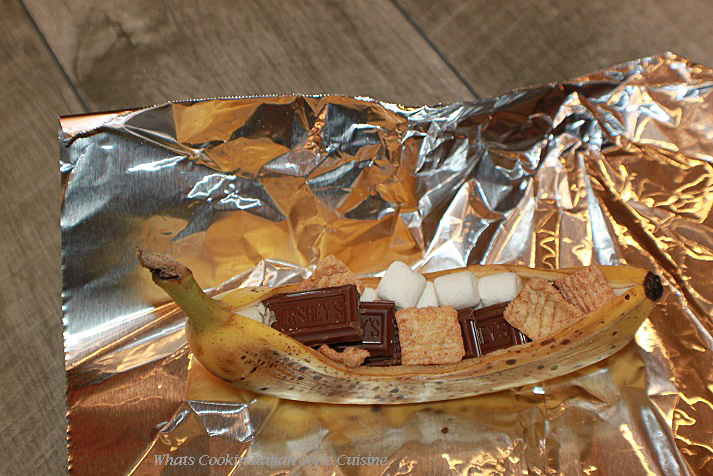 Now who doesn't like s'mores and with banana none-the-less. My grandsons would go next over this quick dessert. 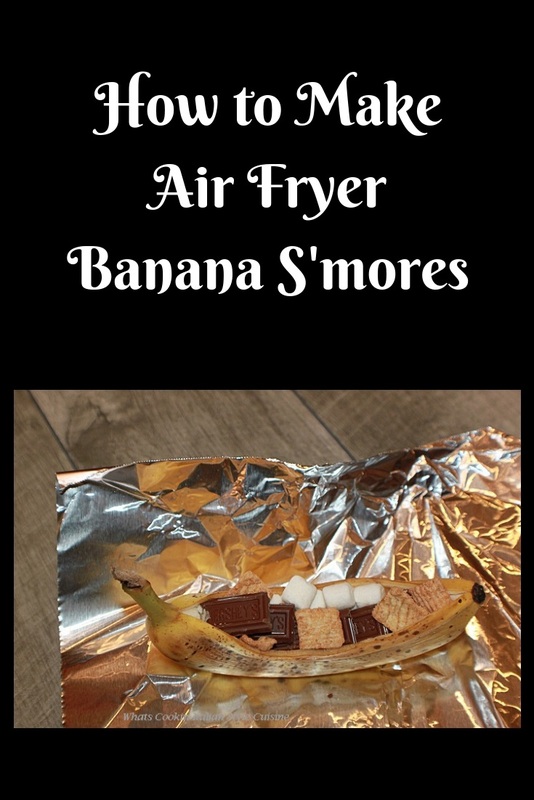 I may have to get an air fryer just so I can make Banana S'Mores. Great recipe! What an easy and delicious dessert! This Air Fryer Banana is so perfect for our afternoon snacks on weekend! My kid will devour in minutes! 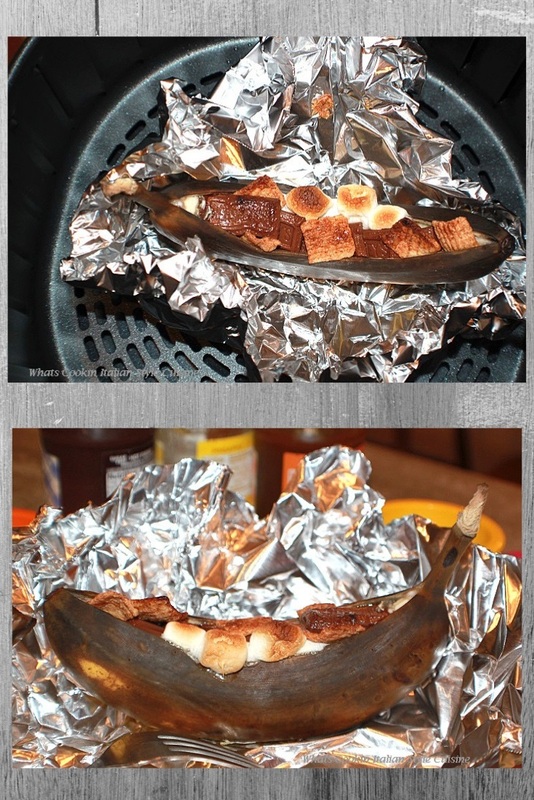 Such a wonderful idea for a quick BBQ dessert - so delicious! Wow this is such a great idea for kids. 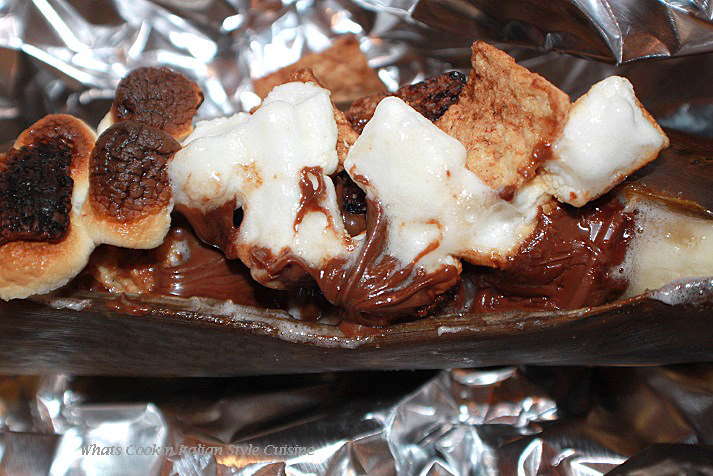 It's super easy to make and who doesn't love melted chocolate and marshmallows, right?! Must give this a try. These were so good! I wasn't sure how they were going to come out in the air fryer, but they turned out great! This looks so yummy. I can't wait for summer to get here, but this might hold me over until it warms up! I remember making these as a kid on the camp fire! I love the idea of doing this inside though! Well, I didn't think I needed an air fryer, but you have just convinced me!! Yum! My friend was just raving about all the great things she makes in her air fryer. I will share this with her and then I think I need my own fryer! My kids went nuts over these! We used the air fry setting on our countertop oven. This is so cute and creative! My nephew would love this, he's crazy about bananas. 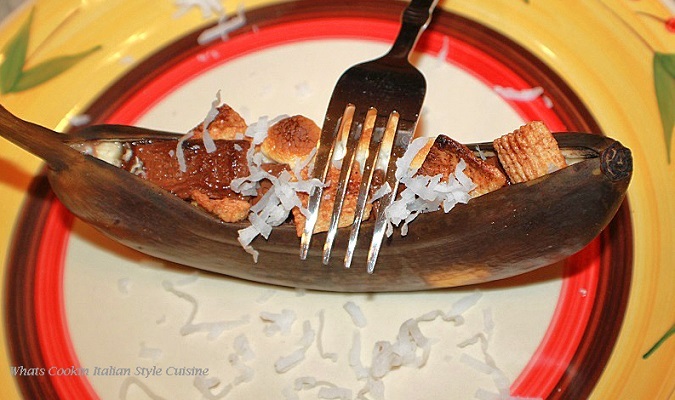 I love the idea of using something like cinnamon toast crunch. I've yet to make any desserts in my airfryer so this is a great idea for me. Thanks! 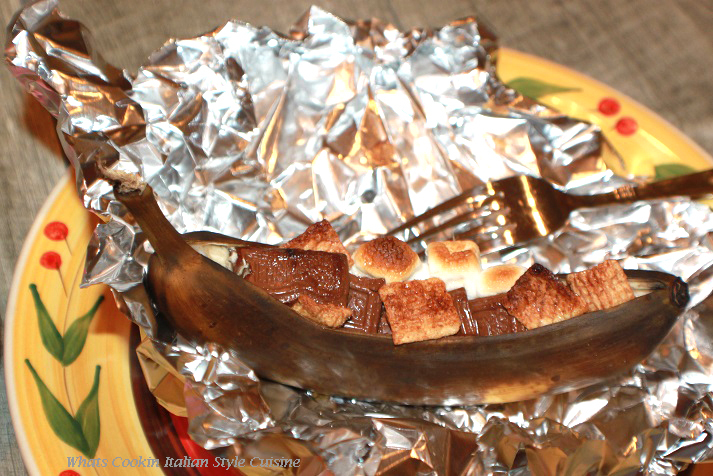 Banana s'mores...what a tasty idea.